Crochet toys are fun to stitch up and make thoughtful gifts for the child or child-at-heart in your life. With the market inundated with so many electronic and plastic toys, a handmade crochet toy is a pleasant option. The following free crochet patterns can be used to create toys that will encourage interactive play. If you need help downloading any of the printables, check out these helpful tips. Finger puppets are great tools to encourage children to use their imagination. Perfect for using up scrap yarn, this basic pattern is worked in a spiral. This is an ideal project for a beginner crocheter. You can download and print the pattern for later use by clicking on the image and selecting either the "save" or "print" icon. Download the pattern for this crochet finger puppet. With red yarn, make a slipknot and a chain 4 loop. Round 1 - Make six single crochet stitches into the center of the loop. Round 2 - Make two single crochets in each stitch, 12 stitches total. Round 3 - Make one single crochet in the first stitch, and two in the next. Repeat around, 18 stitches total. Round 4 - Make a single crochet in each stitch around, 18 stitches total. Rounds 5-10 - Repeat round 4 for six rounds. Round 11- Make a single crochet stitch in the first stitch, and skip the next and make a single crochet in the one after. Repeat all the way around, 12 stitches total. Round 12 - Make a single crochet stitch in each stitch around, 12 stitches total. Tie off yarn and use the yarn needle to weave the ends in. With wing color yarn, make a slipknot and make a chain 4 loop. Round 1 - Make 6 single crochet stitches into the loop. Round 2 - Make 2 stitches in each stitch around, 12 stitches total. Round 3 - Make a single crochet in each stitch around, 12 stitches total. Rounds 4-6 - Repeat round three for 3 more rounds. Round 7 - Make a single crochet in every other stitch around, 6 stitches total. Tie off and leave a long tail for sewing. Make a second identical wing. With beak color yarn make a slipknot and make a 4-chain loop. Round 1 - Make 4 single crochets into the ring. Round 2 - Make a single crochet in each stitch around, 4 stitches total. Tie off and leave a tail for sewing. With feet color yarn, make a slipknot, then slip stitch onto any stitch on the last row of the body. Row 1 - Make a double crochet, slip stitch, double crochet, slip stitch, double crochet slip stitch in the same stitch to make the first foot. Repeat to make a second foot in the next stitch, weave in ends with yarn needle. Sew the wings to the sides of the body, and the beak to the center of the head. Cut tails and weave in the ends. 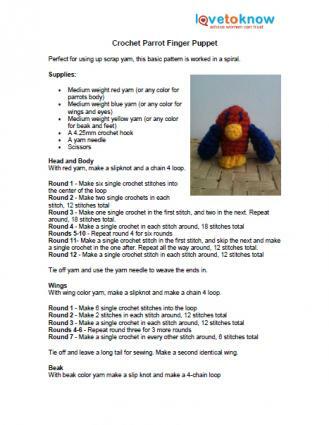 Use a piece of blue yarn to stitch some eyes above the beak. For other variations, this parrot could easily be crocheted in black and white for a penguin, or in shades of blue for a blue jay. Not only is this toy soft and cute, it's also practical. Fun to play with alone or in a group, hacky sack builds coordination and athletic skill. This pattern is suitable for a beginner stitcher. Download and print the pattern for a hacky sack toy. Make a slipknot in your first color of yarn and make a 6 chain loop. Round 1 - Make six single crochet stitches into the ring. Round 2 - Make two single crochet stitches in each stitch around, 12 stitches total. Round 3 - Make one single crochet in the first stitch, and two in the next. Repeat all the way around, 18 stitches total. Round 4 - Make one single crochet in the first two stitches, and two in the next. Repeat all the way around, 24 stitches total. Round 5 - Make one single crochet in the first three stitches, and two in the next. Repeat all the way around, 30 stitches total. Round 6 - Make one single crochet in the first four stitches, and two in the next. Repeat all the way around, 36 stitches total. Rounds 7-8 - Make a single crochet in each stitch around, 36 total. Tie off and leave a long tail for sewing. Make a second piece in a different color for the bottom section of the hacky sack. Make a slipknot with third color yarn and chain 36. Join the joins to form a loop. Rounds 1-3 - Make a single crochet in each stitch across. Tie off, cut ends and weave in the tails. Sew the top to one side of the middle. Fill the half with as many beans or as much corn as possible. Begin sewing the bottom to the other side; stop when you are halfway done. 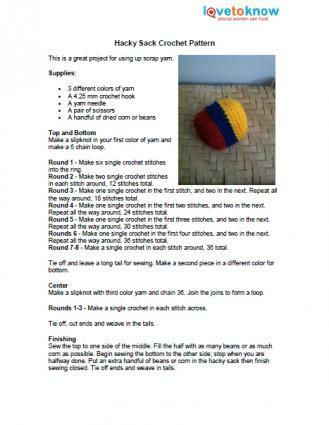 Put an extra handful of beans or corn in the hacky sack then finish sewing closed. Tie off ends and weave in tails. Most toy projects are simple to create even for beginners. With the whimsy of toys, small mistakes are less noticeable than say, if you were crafting a precision doily. They're the perfect starter project. For more free patterns, try some of the following. Crochet Me: A terrific offering of free patterns and ideas for toys and games, including a baby snow dragon and little octopus. Crochet Pattern Central: More than 140 links to toy projects that are updated frequently. Lion Brand Yarn: Lion Brand has always offered fantastic free patterns. You'll need to register to see the patterns, but this is free. Try the crocheted glitter gummi bears, or the teacup and saucer. One of the best things about crochet toys is that you can enjoy playing with them long after they've been created. Make some of these delightful toys to give as gifts, then have hours of fun playing with the recipients. They'll think of you every time they play with their new cuddly toys.